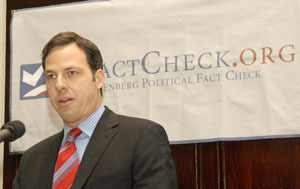 More newspapers and television stations are fact-checking the claims of politicians, and the public seems to love it, according to factchecking practitioners and two new studies released today at a conference sponsored by FactCheck.org and the Annenberg Public Policy Center. Another conference participant, Mark Matthews, a political reporter at San Francisco’s KGO-TV, said viewers in a survey rated his station’s factchecking features as third out of 16 possible “most compelling reasons” to watch local news. 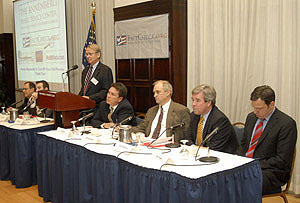 The conference in Washington, D.C., “Pants on Fire, Political Mendacity and the Rise of Media Fact-Checkers,” also included Bill Adair, Washington bureau chief, St. Petersburg Times (“PolitiFact.com”); Michael Dobbs, Washington Post (“The Fact Checker”); and Jake Tapper, senior national correspondent, ABC News, all of whom were on the media panel. Another panel included two political consultants: Ladonna Lee, a Republican political strategist with Foley & Lardner, LLP, and Anita Dunn, a Democratic media strategist with Squier Knapp Dunn Communications. Download the report TV Adwatch Stories: On the Rise. Download the report Newspaper Adwatch Stories: Coming Back Strong. Transcript: Pants on Fire panel. (l-r) Bob Papper, professor and associate chair of journalism, media studies and public relations, Hofstra University; Colin Benedict, news managing editor of WISC-TV in Madison, Wisconsin; Brooks Jackson, director of FactCheck.org; Bill Adair, Washington Bureau Chief for the St. Petersburg Times and the editor of PolitiFact.com; Michael Dobbs, The Fact Checker at the Washington Post; Mark Matthews, political reporter for ABC7 News at KGO-TV, San Francisco; Jake Tapper, senior national correspondent and senior political correspondent for ABC News. 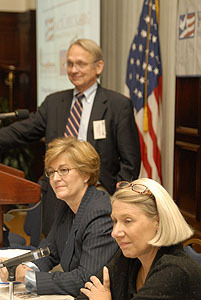 (l-r) Brooks Jackson; Ladonna Lee, vice chair of the government and public affairs practice of Foley & Lardner; Anita Dunn, political consultant with Squier Knapp Dunn Communications.